So, I still haven’t frogged my Edith yet (working up the nerve, and trying to pick a day when I’m in the mood to wind and wash a whole lot of skeins) but I have been doing a lot of playing with wool. 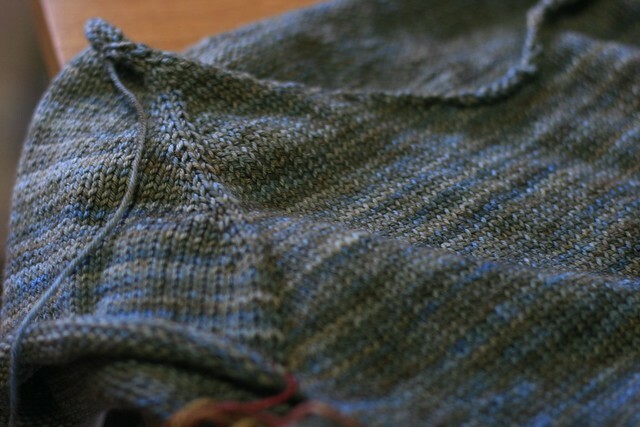 I’ve got another sweater on the needles which has maybe been on the needles since March, but I thought I’d share. This is Clarke,, a sweater knit from a really lovely, basic sweater pattern by Jane Richmond. 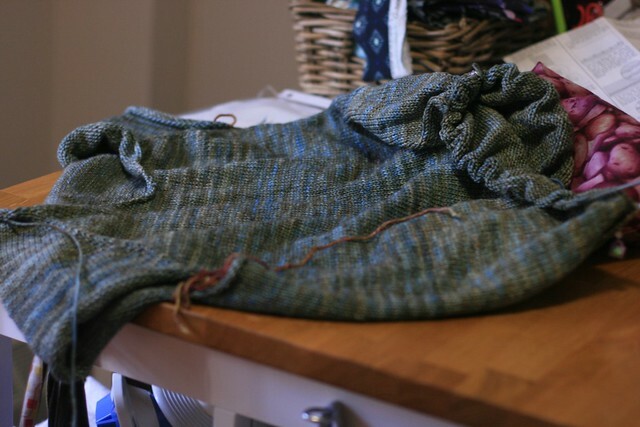 It’s worked in one piece, which means no seaming, but also means that it’s mostly a blue-ish, greenish yarny blob. I’ve tried it on and I promise it’s sweater-shaped, but I realize it’s not the most glamorous thing to photograph right now. I picked this pattern specifically to create a hand knit version of a RTW sweater I bought this winter. I bought a machine-knit, wool pullover with a high-low hem on a whim over the holidays, and it has turned out to be the wardrobe staple I didn’t know I needed. I wore it pretty much daily through the winter – around the house over pyjamas on cold days, as a top with leggings or jeans when I was feeling lazy about picking an outfit – and on cold spring days I did my best to keep wearing it, basically all. The. Time. I wanted to make a hand knit sweater that would supplement that niche, in a different colour. The pattern is written for stripes, but I decided I wanted to work it in a solid sweater. This was partly because it makes for a more versatile wardrobe addition, and also because I wasn’t 100% on the pattern I was going to use. I was worried that if I decided to frog or go with a different pattern, I’d be stuck with a SQ of yarn that had to be worked in stripes, and didn’t want to get limited if I swatched and couldn’t match gauge. I’ve made my way through the end of the sweater body and am actually well into the second sleeve, and I’m pretty happy with it so far. I’m working it in Madelinetosh DK in Cove, which is knitting up into a lovely semisolid fabric, and am generally very excited to have this in my closet. The big limitation to working on this is how big it is. It basically lives on my couch now, and because I’ve been travelling a lot over the past couple months, this hasn’t received as much knitting time as it should have. 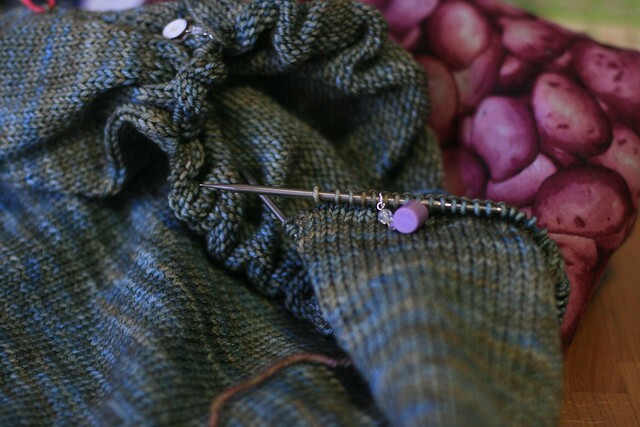 Currently, I’m pushing to get it done – partly just because it should be done, and also because I’ve got yarn picked out for a more summer-appropriate knit, and this needs to be off the needles first! So are you making this one with a hi-low hem? I’ve been wanting to knit the Clarke pullover too- I have some baby alpaca that would be perfect. I love the yarn you have chosen for yours- I’m excited to see it, it’s such a nice classic fit that a stripeless version will be fantastic.